Following the DGS Irish Gathering in July 2005, our Chairman, Michael Dalton, reviews the state of play on researching the family history of Irish Daltons and what the future holds. The recent Dalton Genealogical Society gathering held in Dublin brought together descendants of no less than thirteen different Irish Dalton lines. Add to these other Irish Dalton lines of DGS members who did not come to Dublin, and then perhaps many more not represented at all amongst the DGS membership, and you have a myriad of 25, 50 or maybe 100 lines to unravel. Since I visited Dublin in October last year to plan our gathering, I have had the opportunity to amass a substantial file of data about Irish Daltons. With the passing of each month, I have become more and more fascinated by the richness and the diversity of these Dalton lines and particularly their historical context. Here we have a fascinating field of study with much discovered and so much more still to be revealed. I cannot claim Irish Dalton descent – so, on the one hand I do not have that intense interest in a particular line, and on the other I perhaps can be a little more objective in trying to draw it all together. Where to begin? Well, in this note, I am not going to spell out all the details of each and every line. Some are already chronicled elsewhere, others will find their way in to the pages of the DGS Journal or onto the DGS website. Rather, what I want to do is share some of the diversity and the exciting history that comes together under this Irish Dalton banner. At the Saturday morning conference in Dublin, we spent a little time listening to the delegates with Irish Dalton ancestry telling us about their Dalton forebears and the current status of their researches. What follow therefore are a few notes about each of the thirteen lines, and who among our members has an interest in them. This framework can and will be added to in future "Daltons in History" monthly newsletters on the DGS website. K. T. Mapstone resides in Saltillo, Mississippi and has undertaken substantial research into her Irish Daltons.. K. T.’s Daltons are from Kilcash, County Tipperary, midway betweel Clonmel and Carrick-on-Suir. Her great great grandfather, James Dalton was a Kilcash Dalton. His son Patrick Dalton married Catherine Colbert at St. Nicholas Church in Carrick-on Suir. Catherine was a resident of Carrick and was employed in its woolen factory. Her grandfather Andrew Colbert Dalton was born in Carrigaloe townland, Kilcash and the family’s ancestral home is still standing in the foothills of Slievenamon, north of Kilcash Woods. With K. T. at the Dublin AGM was Randall Bong grandson of Hannah Dalton O’Brien. Randy is a nephew of DGS member William O’Brien, Hometown, Florida and attended the AGM on his behalf. K. T., William O’Brien, Randy and DGS member Frank Dalton of Menlo Park, California are all descended from James Dalton of Kilcash. Also with K. T. at the Dublin AGM was DGS member Patrick Dalton whose family is from the Clonmel, County Tipperary area. His current residence is Ballinasloe, County Galway and his ancestral home is in Newcastle, Co. Tipperary. Patrick is the nephew of the late Patrick J. Dalton, Bishop of Yola, Nigeria and DGS member Sister Philomena Dalton of Ireland. Sisters, Daveda Bundy from Pickerington, Ohio, USA and Cecelia Lange from Arvada, Colorado, USA are DGS members descended from Peter Dalton, a farmer who was born in about 1752 in Darmstown (now Durhamstown), which is in the Ardbraccan/Bohermeen Parish in Co Meath, between Navan and Kells. Peter married Nancy Naulty also of Darmstown and their firstborn of ten was a son, John J Dalton, born about 1786. John married Mary McGovern from nearby Ongenstown and they emigrated to America, their fifth of six children, Mathew William Dalton, great grandfather of Daveda and Cecelia, being born in Madrid, St Lawrence, New York State on 1 November 1829. DGS member and major contributor to the Irish section of the Dalton Data Bank, Mike Dalton from Portland, Oregon, USA came to Dublin with his brother, Bob from California. Mike and Bob are the great great grandsons of John Dalton of Ballheigue Parish, Co Kerry, who married Mary (Elizabeth) Anderson at Heirhill in October 1817. It was Mike and Bob’s grandfather, Thomas Stephan Dalton, born in 1865, who emigrated to San Francisco, California around the turn of the century. Ballyheigue can be found on the Kerry coast, north of Tralee and south of the Shannon estuary. Mike writes that, although there are other Daltons in the Ballyheigue and North Co Kerry records, no definite links have been made to date. A recent survey indicates some migration from Great Britain and Northern Ireland into the North Co Kerry area during the 17th Century and following. DNA test results to date suggest Anglo Saxon origins rather than the more common Western European origins of Irish Daltons. There is plenty of scope for further research here and Mike is actively pursuing this. Eric Dalton, a DGS member from New Hudson, Michigan, USA, is the great great great great grandson of Michael Dalton, who was born about 1745 in Glenbrohane, Co Limerick. He married Mary Hanley about 1780 and it was their great grandson, Michael James Dalton, born 29 August 1866 in Glenbrohane, who, with his sister Bridget emigrated to America and settled in Detroit, Michigan. James and Bridget, described respectively as a labourer aged 20 and a servant aged 18 embarked on the SS City of Berlin from Queenstown, Ireland as steerage passengers in 1890. They arrived in New York on 25 March 1890. Michael married Mary Hurley on 1 June 1899 in the Most Holy Trinity Church, Detroit and they are Eric’s great grand parents. Eric writes that he has been fortunate to be able to trace his line back to the mid 18th Century, but he says that he may not be able to get back much further due to lack of records. He hopes that the DGS DNA Project might bridge the gap and enable him to tie into one of the older documented family lines. DGS members and cousins from Australia, Wendy Fleming from Melbourne, Victoria and Helen Smith from Sydney, New South Wales met up with another cousin, James Dalton from Co Limerick when they came to Ireland for the Gathering. A year ago, following a match found through the DGS DNA Project, Wendy and her daughter, Allison, visited new found Dalton relatives, Edward Dalton and his sister Maizie, in St Louis, Missouri, USA (see MN&Q 41.6 on p 13 in DGSJ Vol 41). All of these folk are descended from Daltons of Co Westmeath. Edward and Maizie’s great grandfather was Christopher Andrew Dalton born in 1838 in Co Westmeath, who emigrated to America and died in Paterson, New Jersey in 1882. Attending the gathering conference on the Saturday morning was James Norman, who is the genealogical researcher and acting chairperson of the O’Higgins Clan. James lectures in the School of Education Studies at Dublin City University and was particularly interested to hear the presentation by Patrick Guinness, as the O’Higgins Clan is just embarking on its own DNA project. Co-incidentally, amongst James’s acquaintances is Ciaran Dalton from Ringsend, Dublin, who was due to join James at the gathering but unfortunately at the last moment was unable to be with us. James informed us that Ciaran’s family originally came from Torbay, Devon in the early 1800s after Captain William Bligh completed his survey of Dublin Bay, which found a large harvest of shell fish. The Daltons were trawler men in Torbay and moved over to Ringsend in Dublin Bay to fish and have remained there until the present day. Ian d’Alton of Naas, Co Kildare is descended from d’Altons from Ballycahane in Co Limerick and Woodpark in Co Clare. According to Ian, the family came from Lancashire to Ireland in the late 17th Century. He has original documents relating to the justiceship of the peace and deputy lieutenantships of Co Clare in the period 1773 to 1814. Also there is some correspondence in the British Library between Michael d’Alton of Ross Castle, near Bunratty, Co Clare and Robert Peel, then Chief Secretary for Ireland, in 1816 and 1819, mainly relating to employment prospects for his son. Millicent Craig writes that, as you look at where Daltons in general clustered after the land dispossessions of the landed Catholic families in Co Meath and Co Westmeath, they went far west and far south. The Woodpark Daltons were in a sense unique - they were obviously a tight knit clan of means who married well. In order to retain 280 acres of land after the enactment of the Penal Laws, the matriarch of the family went to Dublin and converted to become a Protestant. Dalton is a rare surname in Co Clare but as late as 1999 there was one Dalton living in Sixmilebridge. When at Bunratty after the DGS Gathering, Millicent heard of another lady who was a Dalton from an old Clare family, so Ian may still have some relatives in the area. In the Dalton Data Bank there is a Jane Dalton of Deer Park, Bunratty who married a John Lysaght in 1763. Ian, who is equally interested to learn more about his Lancashire origins, has plenty of avenues for further research. DGS committee member, Mel Irwin from Bolton, Lancashire is descended from Daltons in Co Tipperary, although he believes that the family originally came from France with the name being spelt D’Alton. Both sides of Mel’s family were farmers and policemen. His grandmother was Ellen Dalton, the eleventh of twelve, born 14 January 1900 in Templederry, Co Tipperary. She married James Frederick Irwin in Belfast in 1922. Her parents were Joseph Dalton (D’Alton) who married Mary Ann Ryan on 6 April 1875 at Ballymackey Church, Co Tipperary. Ballymackey is in the north of Co Tipperary not far from Nenagh. Incidentally, Mel’s wife, Dairne is also of Irish descent. DGS member, Gerald Milner of Shoreham by Sea, West Sussex is descended from Daltons who lived in Lisburn, Co Antrim, in the Province of Northern Ireland. Prior to their arrival in Dublin, Gerald and his wife, Margaret stayed in Belfast and did some research into Gerald’s Dalton ancestors. Readers of the DGS Journal may recall MN&Q 40.1 in Vol 40, where Gerald describes the sad end of Charles Dalton and his immediate family, members of the same Co Antrim Dalton family, who lost their lives when the Cospatrick caught fire in the Atlantic off South Africa, south west of the Cape of Good Hope on her way to Auckland, New Zealand. Pat Robinson, a long standing DGS member from Barrington near Cambridge, has written two long articles for the DGS Journal – the first was back in 1994 in Vol 22 pp 24-32, Success at last, the Daltons of Kildalton; and the second appeared just last year in Vol 41 pp 28-32, Bishop Daton (Dalton) of Kilkenny. Pat’s line is traced with certainty back to her great great grandfather, Michael Dalton, who was probably born early in the 19th Century. His branch of the family lived in the Ballinura and Newtown/Lennon areas, near Carrick-on-Suir. He may be the Michael Dalton who married at Newtown, Co Tipperary on 10 February 1834. The Dalton family had had a long and colourful history in Ireland and it is claimed that Michael is a descendant of Redmond Dalton, brother of Dr William Dalton (1644-1712, Bishop of Ossory, exiled to France 1698), sister of a nun who became Abbess of the Convent of St Denys in Paris, and son of William Dalton of Manor Hill, Thomastown, himself descended from the William Da(l)ton who went to Ireland in about 1171 with Richard de Clare, Earl of Pembroke, better known as “Strongbow”. It is said that Michael tried to lay claim, as others of the family had before, to the Kildalton Castle/Bessborough House 2000 acre estate (seized by Cromwell and given to the Ponsonby/Bessborough family in the 17th Century) and eventually got into serious trouble - possibly involving violence and imprisonment - with the authorities, and had to leave Ireland for the United States “with a price on his head”. He was a farmer or farm labourer. He emigrated about 1850 from Ireland to America. Michael had two sons, William and James, who stayed in Ireland, the former a shoemaker in Newtown and the latter a tailor in Carrick-on-Suir. 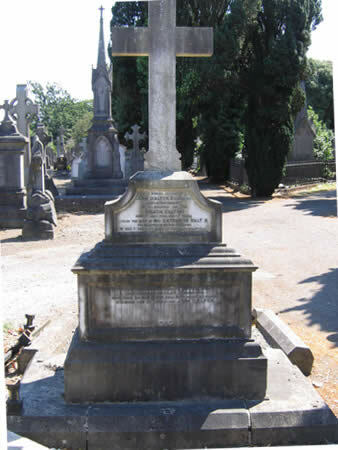 His other three sons, John, Walter and Edward emigrated from Ireland to Australia - two of them were stonemasons and one a carpenter. James born about 1842 was Pat’s great grandfather, and his daughter Jane, born 22 February 1882 is Pat’s grandmother. The Rev Margaret Engler from London was at the Dublin Gathering with her daughter, Katherine. She knows that her great grandfather was Walter Dalton, born about 1837 in Ireland, possibly in Co Waterford or in Co Wexford. He came to England and married Ellen Omaha from Derby in 1869. He was a coal miner. Walter and Ellen had four children, the second of whom was Michael Walter born in Lindon, Derby in 1874. This is Margaret’s grandfather. Bernadette Walsh, a new member of the DGS from Gorey, Co Wexford joined us in Dublin. She has traced her Dalton line back to her great great grandfather, Andrew Dalton, born in 1825 in the Parish of Kilnahue, Annagh, Gorey. His father was a James Dalton and James’s father was a Lawrence Dalton. Andrew married Sarah Quail on 12 October 1865 and they had five daughters, the middle one, Sarah born 1 February 1871 is Bernie’s great grandmother. Our last group (but by no means the least) was represented at the gathering by no less than 15 descendants, spanning three if not four generations, who joined us on the Sunday at Mount Dalton. Brendan Dalton, who lives and works in Dublin, contacted the Society when he discovered that he would be on a boating trip on the Royal Canal that passes through Mullingar and near Rathconrath, just by the Mount Dalton estate, at the end of July. So he timed his trip to stop over at Rathconrath on the Sunday. Brendan knows that his grandfather came from Stoneyford, Co Kilkenny and his father’s and his generation have all lived in Dublin. He is eager to trace his Dalton line back further. At the Saturday morning conference, I set a challenge – to reduce the number thirteen, and we made a start while we were in Dublin. One of the most rewarding aspects of family history research is that moment when you discover a missing link. Suddenly there is a whole new perspective on your understanding of the line of descent you are researching. The Society is now poised to assist everyone with an interest in Irish Daltons. Through the Dalton Data Bank, we have amassed a formidable amount of source material for searching. This will continue to be expanded thanks to the efforts of a number of members who are actively identifying records and preparing them for adding to the database. Through the DGS International DNA Project, we will be able to identify DNA matches and suggest possible links, where we can then concentrate our genealogical research and have the best opportunity of proving these links. Through the DGS website, we will keep everyone informed about the progress of our researches, drawing new Irish Dalton descendants into the Society as they discover the benefits that membership brings. And through the DGS Journal, we will provide in-depth articles, each giving a full account of a particular line and setting it in its historical context. In addition we will arrange future DGS Gatherings in Ireland, which will help to focus our thoughts and enable like-minded DGS members to share their knowledge and their interest at first hand face to face. Plans are already being made for an event to take place in Summer 2008, now less than three years away. Who knows what we will have achieved by then? One thing is certain - between now and 2008, there will be many of those rewarding moments in prospect for DGS members of Irish Dalton descent as those vital new links are discovered. An exciting prospect indeed. Several of our DGS members from America went on separate excursions before and after the AGM in July 2005 to record items of Dalton interest. Our appreciation is extended to Mike and Bob Dalton, Daveda Bundy and Cecelia Lange, and Eric Dalton for sending the following items to share. Mike Dalton was intrigued by the escallop shell carved into a broken concrete frontispiece on the main doorstep of the manor at Mount Dalton. The concrete also bears the date, 1786, the date that the house was built. Mike sent the following historical explanation of the shell. Editor’s note. It is also worth a mention that Daltons from England accompanied the Crusades to the Holy Land and that the escallop shell could be a connection between lines. Mike Dalton and his brother Bob traveled through Ireland and were delegates to the AGM in Dublin and at Mount Dalton in July/ August, 2005. As they toured they sought sites of historical interest to other Daltons and photographed them. Mike as you may know has been the principal microfilm extractor of Daltons for the Republic of Ireland files in the Dalton Data Bank. At Glasnevin Cemetery they photographed the memorial of John D’Alton, the famed historian of Dublin and copied the inscriptions as below. D’Alton was born in Bassville, County Westmeath. He purchased the Glasnevin plot for himself and family about 1852. Also the body of said John D’Alton who died 20ty day of January, 1867 – age 74 years; also the body of Clarice D’Alton, the beloved wife of William D’Alton, the oldest and son of said John D’Alton wjo died on 25 December 1891; also the body of said William D’Alton who died 17 November 1892, age 74 years. The Burial ground of John D’Esquire, barrister – here lies the remains of his beloved daughter Helena Dalton – died 7 August 1852, age 19 years; also the body of Nrs, Catherine D’Alton, his beloved wife for 44 years. She died 1st February, 1859, age 64 yeara, requiescat in pace. Here lies the remains of Edward Dalton of 1 Brighton Terrace, Monkstone who died 6 July 1908, age 79 years, the youngest son of above John D’Alton, r. i. p.
Also the body of Kate Dalton, second daughter of said John D’Alton who died 17 March 1897, age 72 years. “My sister Daveda Bundy and I just returned from the Dalton Genealogical Society gathering and meeting in Dublin. While in Ireland we examined Ardbraccan/Bohermeen Parish records. Our ancestors, Peter and Nancy Naulty lived in this Parish. Navan parish records (Navan and Bohermeen are neighbors) and the Mullingar records were available at the National Library in Dublin. We also perused the 1821 Census where we think we found John J. Dalton, his wife Mary McGovern, and their first born Peter. “I did more research on this trip than I had originally expected, but the records were available so I felt that I needed to search as much as possible while I had the opportunity. With the land records that I obtained from the Valuation Office in Dublin, I am able to put together a short history of the ownership of the house in Glenbrohane where my great-grandfather was born in 1866. I can track the owners and tenants of the property from the early 1800's up to the present day. I met the current owner of the house (not a Dalton) who was very happy to talk with me since he said that he was interested in the history of the place, but could not get much information from his neighbors. The last Dalton who lived in the old house was a Frank Dalton who died in 1985. I gather from relatives that he was a bit reclusive and I never met him although I had tried on two occasions. Joyce Dalton sent the Family History for her father, Boyce J. Dalton (living DNA donor). Boyce Dalton is the son of John Kelly Dalton (b. March 25, 1887 in Pulaski County, Kentucky; d. May 6, 1964) and Nancy Sallie Clifton (b. February 17, 1891 in Pulaski County, Kentucky; d. January 3, 1965). Grandson of Thomas Dyer Dalton (b. January 4, 1846 in Pulaski County, Kentucky; d. March 25, 1923) and Mary Jane Tarter (b. 1847; d. 1903). DGS member, Kathy Parry sent the following information. Her maternal gr. gr. grandfather, George S. King married Josephine Campbell and both were of Maryland. Josephine Campbell was the daughter of Anna Marie Dalton of Maryland and B. U. Campbell of Baltimore. oBalt. She found a reference that Anna Marie was the daughter of Mrs. McNeal by her first marriage (records from St. Joseph’s R. C. Church at Emmitsburg). Then she found another reference that stated that Anna Marie was the daughter of George and Catherine Dalton from Early Catholic Church Records in Baltimore, Maryland 1782 through 1800 from the original records of "Old St. Peter's Cathedral"., Compiled by Mary A. and Stanley G. Piet, Westminster, MD: Family Line Publications, 1989, p.30. The same reference stated that Catherine Venny, a native of Ireland, married George Dalton of Newburyport, MA in Baltimore Jan 21, 1798; Early Catholic Church Records in Baltimore, Maryland 1782 through 1800, p.130. The same reference showed that a Catherine Dalton married Col. Daniel McMeal in Baltimore on 27 Nov 1800, as a widow. I have to assume that this is really Daniel McNeal. Early Catholic Church Records in Baltimore, Maryland 1782 through 1800 , p.140. Griffith's Valuation shows a Bridget Dalton occupying home/office/12 acres with a Richard Brannan. Being that Brannan was Bridget's maiden name, I presume that Richard Brannan is probably a brother. I am all but certain that this is my grandmother because it is in Farnagh Townland, Parish of Kiltoghert, Barony of Leitrim and County of Leitrim. This all ties in with the information that I have from the genealogy center in Ballinamore. I hope somebody out there is looking for a Brannan and Dalton tie-in. Contact: v.vaughn@verizon.net - she is my daughter Vicki who is my genealogy partner on the West Coast. I have found that my grandmother’s sisters had accounts at the Irish Immigrant Bank in the 1800 period. I do not have birthdates for any of them. What I do have are the baptisimal dates that I obtained from the genealogy center in Ballinamore, County Leitrim. The sisters are the children of William Dalton and Bridget (Delia) Brennan. They were all born in Kiltoghert, County Leitrim. I am not certain that all of them came to America. Does anyone recognize any of them? Elizabeth married a John Moran in Kiltoghert Parish on October 28, 1861. They had five children. Anne, John, William, James and Richard Arthur. Jane Dalton (Jennie) was my grandmother and married Martin Joseph Vaughan about 1882/1883. They lived all of their married life in New York City. They had five children, one of them apparently died while an infant. The children that lived are: William, Martin, Thomas and Cornelius. Cornelius was my father. My grandfather was from Co Tipperary. His father was Thomas Vaughan and his mother was Katie Borden. I cannot find a marriage of Thomas and Katie.